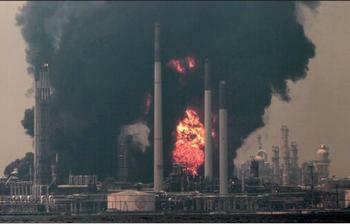 SINGAPORE, September 29, 2011 (ENS) – A fire at Shell’s Pulau Bukom refinery on an island near the Singapore mainland was extinguished late Thursday night, local time, after blazing intermittently for 36 hours. The massive fire sent plumes of black smoke high into the atmosphere. Shell officials said earlier on Thursday that they are closing all refining units at the facility, Shell’s largest petrochemical production and export centre in the Asia Pacific region. The procedure could take up to two days. “We are focused on safety, and are going through the progressive shutdown of the refinery,” Vice President for Manufacturing Operations Martijn van Koten told reporters. “The affected area has lengths of pipelines and connected pumps, and holds a mix of hydrocarbons. This was the reason for the erratic fire, sometimes waning and sometimes growing,” Shell said in a statement Thursday. Shell crews worked with the Singapore Civil Defence Force throughout the night to put out the fire. Six fire engines and about 80 Singapore Civil Defence firefighters responded to the emergency. Six Shell firefighters were injured while battling the blaze but have returned to their normal duties after medical attention, the company said. Two Singapore Civil Defence fire engines were badly damaged by the fire. All non-essential staff from Pulau Bukom have been evacuated from the island. Shell’s global fire consultants arrived at the site today to provide inputs to the team. The National Environment Agency said that depending on wind conditions and efforts to control the situation, smoke from the fire at Bukom may have some effects on the air quality in the western parts of Singapore. Residents in these areas may also experience some soot fallout, the agency warned. “While there is no cause for alarm currently, those with respiratory problems should avoid the western part of Singapore near Bukom,” said the agency. Pulau Bukom is situated on an island 5.5 km (three miles) southwest of Singapore. It forms part of a group of southern islands that have been identified for petrochemical and other industrial manufacturing. The Pulau Bukom Manufacturing Site is the largest Shell refinery globally in terms of crude distillation capacity, 500,000 barrels per day. It includes a world-class ethylene cracker complex and a butadiene extraction unit.